Capitalists@Work: Crow, Benn ... Who's Left? Crow, Benn ... Who's Left? Not such a good week for the unreconstructed Left. Benn was a museum-piece though, and Crow was evidently quite *flexible* in his ideology when it came down to the nitty-gritty. National treasures, both. Yes, when it comes to graveside eulogies those of us on the right always remember the niceties. I'm reading Dominic Sandbrook's massive seasons in the sun - 1974-1979. Benn comes across as as paranoid as Wilson. He was convinced he was going to be assassinated by MI5. And he was sure that army was going to step in with a coup and remove the labour government. And Sandbrook is fairly sympathetic to the man. Seems he was quite toxic even back in the 1970s.He was the minister that featured the least in the party politicals and was shunted to far away venues to talk to a handful of activists to keep him out of the papers. Wilson's campaign strategist thought that the Bennite rhetoric was good for the party but "was obviously complete fantasy for a proper government and Harold had no intention of implementing any part of it.."
Stop the war saved him really. Finally gave him something he could actually be right about for once. "Stop the war saved him really. Finally gave him something he could actually be right about for once." What a wonderful epitome of the God-awfulness of Blair. Neither Crow nor Benn liked Blair. If this is what passes for 'national treasure' then perhaps we oughtn't be surprised when it gets buried. BQ - yes, a great read that book, and it certainly puts the knife into Benn, who clearly was more interested in himself than the Labour Party. But what really gets me about the lurvvvv bestowed on the man is that he was yet another member of the post-war Left who refused to acknowledge what Stalin and Mao did. Here's Benn on Mao, when Mao died. ..he was "a great admirer of Mao … he made mistakes, because everybody does". Only noticed this now. 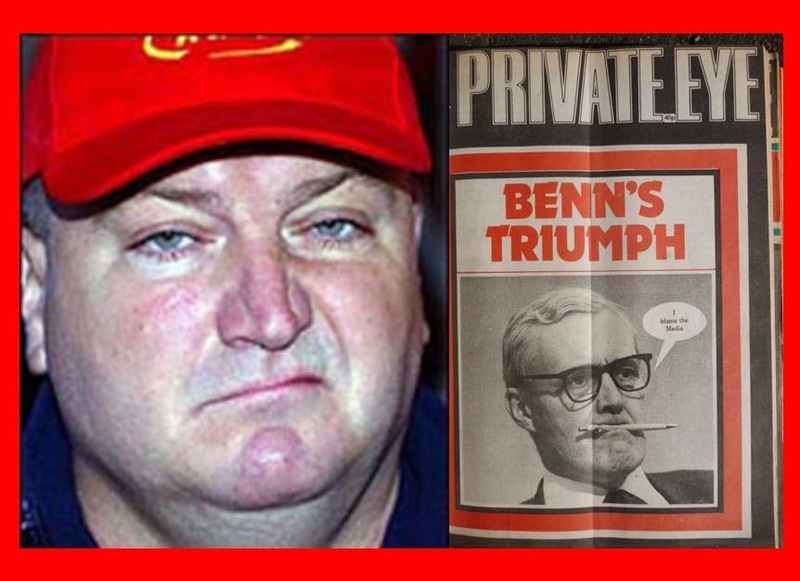 Benn was wrong on so many counts, definately a character he looks to belong to a different age. He did however believe in parliamentary democracy and was against the EU, as did Enoch Powell. Like Powell, he wasnt as good at the dirty realism of politics as he might have thought. Benn was a giant. As were Thatch and Lawson. Even Lamont looks like a hero compared with today's pigmies. I'm not totally convinced that it counts as paranoia if the sequence of events had given rise to Benn becoming PM that MI5 wouldn't have done the decent. Just goes to show you cannot be wrong about everything. ... or for the first time in 10 years, I am left with the feeling that the was might yet turn out to be a good thing. He was a vocally and intellectually able man who believed in his principles to the extent he sacrificed almost everything else that was real. That Crow and Benn were anti EU goes ignored by the BBC. "Benn was wrong on so many counts, definitely a character he looks to belong to a different age." He was correct on one issue - hereditary titles. Now they do belong to a different age. I'll miss him. He was an old charmer. With his twinkle and speech impediment. He even put up with my mum on a train journey once. She was all swoony when she told me about it, poor man. I think his 2007 dream was probably about right. He's how I visualised Beast of Clerkenwell, Lilith. ... Oh. I see. You meant Mr Benn.